So the other night, I got a lot of my favorite things available at home. 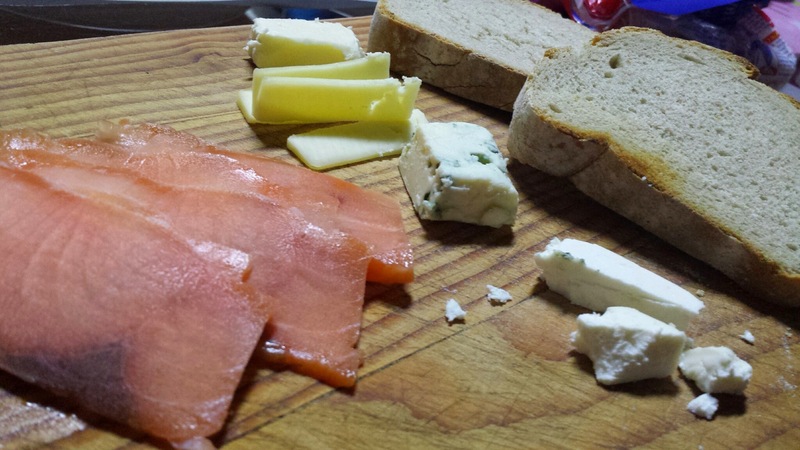 A loaf of sourdough rye bread, my forever love of cured salmon, and a bajillion variety of cheeses. So instead of eating my usual dinner, I got out the salmon, sliced some of my bread (yes, MY bread, since I am the only one allowed to eat it at home), and the cheese platter thing that my sister got me from Spain which had 4 cheeses in it of blue, brie, emmental and rulo cabra. I set this all on a board, and I could have gotten more items like olives, nuts, etc. But I will be stuffed if I do. So I stuck with this. A review on the cheeses though. i have tasted everything before except for the goat cheese rulo cabra. Is it such a surprise that these cheeses taste better in general. The blue cheese was not overpowering, which I find too common in blue cheeses we have available here. The emmental, which I have generally taken a dislike to, was creamier, though still a hard cheese. The rulo cabra was creamy and strong. The brie, which is my favorite cheese of all time, was the loser in this case. It still tasted good, but it seemed indistinct compared to the cheeses I have here. But over all, it was a totally happy place to be in.